This summer marks Dee Simpson’s 15th anniversary of working for Ferrous Processing &Trading (FPT). Throughout her time with FPT, she has also held another high demand job – with the U.S. Air Force. Not only is Simpson a scale operator at FPT’s Pontiac yard, she is also a Senior Master Sergeant with the 910th Force Support Squadron, part of the 910th Airlift Wing out of Youngstown, Ohio. 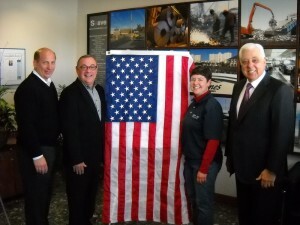 Following her most recent tour of duty, Simpson presented a flag flown on all of the different aircraft currently deployed in the Middle Eastern arena to Anthony Soave and Ferrous Processing’s Howard Sherman and Steve Benacquisto. Air Force-issued accompanying certificates provided details from each of the aircraft: an F-22 fighter aircraft, an F-15 fighter aircraft, a U-2 high altitude surveillance aircraft, an E-3 Sentry surveillance aircraft, a KC-135 air refueling aircraft, and a Predator drone. During her deployment to the Middle East, Simpson served as a Sustainment Flight Superintendent, overseeing food, fitness and lodging for the entire Air Force base. With three direct reports and 44 additional enlisted personnel under them, she provided for the comfort of approximately 4200 troops. On behalf of Soave Enterprises, thank you for your service, Dee.